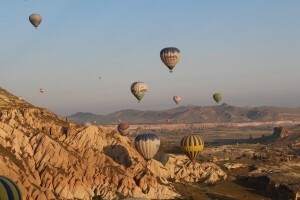 A Q&A About Hot Air Balloon Rides - JP loves LIFE! As I’ve shared photos and a few stories about hot air balloon rides, I’ve also gotten a few questions here and there. I thought doing a short Q&A post may be helpful since some of the questions are quick details that didn’t necessarily fit in the other posts about my overcoming my fear of heights and some of the things I learned on the flight. The cost was about $200 for the morning (transportation from hotel, small breakfast as we watched the balloon fill, hour flight, toast & transport home). It may sound like a bit much for an hour flight, but think about how much you spend for an hour flight on a plane just to get somewhere and suddenly it seems really reasonable. My friend Danyelle took a hot air balloon ride in Arizona this spring and it seems like it may be similarly priced. How many people fit in the balloon? There were a couple of different sized balloons. The one I was in had room for 10 guests and the pilot but at the last minute we had some folks back out. I have to admit I kind of liked the extra elbow room! 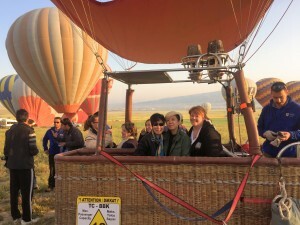 The balloon had three sections — you can see me & friends I met while traveling on one side, another passenger joined our side. Behind us are another four passengers and the pilot had his on area he shared with tanks, etc. There were some other balloons that were bigger too, I couldn’t help but notice that some had the pilot in the center and closer to 20 people. The flight was in Cappadocia, Turkey which is a really unique area of the world…. home of several of the UNESCO World Heritage Sites. 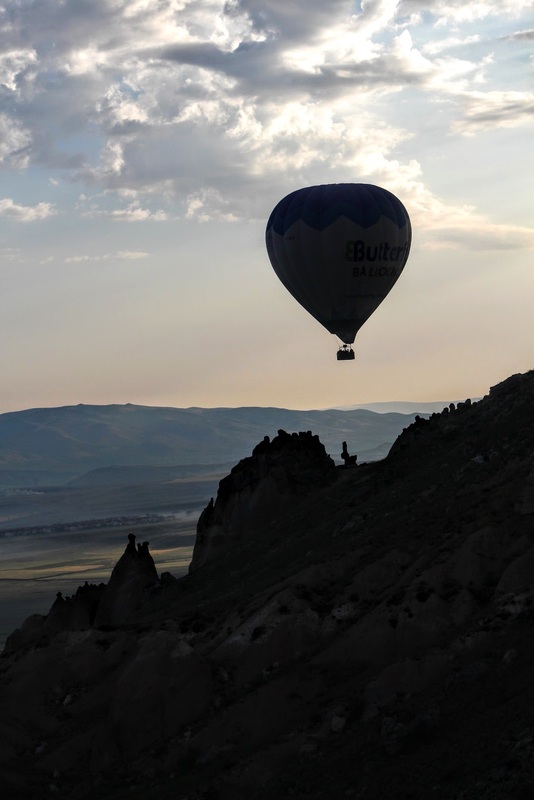 Cappadocia is in central Turkey, just south of the country’s capital Ankara. It was purely a scenic flight… amazing how many changes in landscape there were! If you missed the video from the flight, you should check it out. We got to the field where the team had the balloon already laid out, fans and burners blowing. My guess is they had been at it for 30 minutes or more and it took probably 30 minutes or so for the balloon to begin to lift from the ground and then it went pretty quickly and we all hopped in. Different sized balloons can go to different heights. We went to 1,350 meters above sea level (4,400 feet), about 300 meters (about 1,000 feet) above the ground. It was interesting the pilot explained going high is easy but maneuvering for really good views… that’s his focus. It was incredibly peaceful. Virtually the only sounds are each other in the basket and the sound of the burner which you grow so used to that you don’t even hear it! 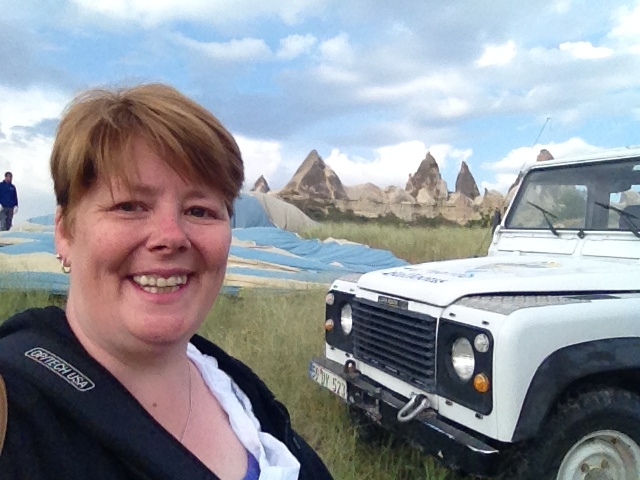 There was one place where we flew in close to the caves and pigeon houses…. farmers in that area encourage pigeons to roost nearby because of the fertility boost they get from the dropping. We could hear the birds pretty clearly, it was amazingly peaceful. It was INCREDIBLY stable which probably was one of the primary reasons I didn’t get too worried about heights. LOL! Seriously, it was just like you were floating with the exception of a bit of rocking on takeoff & landing. The info from the balloon company made sure we all knew to bring a light jacket and that morning before the sun came up it was pretty cool! But as the sun came out and as the burner blew, it was really quite nice up there! I think the burner sort of neutralized the altitude difference for me but I am guessing it could be pretty cool without the sunshine. I love good travel mates so if you are serious, let me know! Are there traditions or superstitions that go along with hot air balloons? 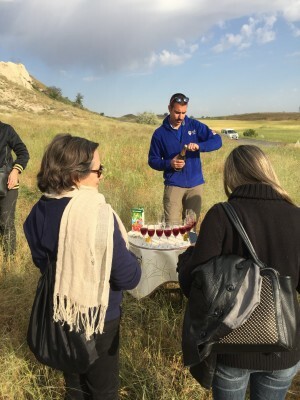 I loved the fact that Oguz told us it is tradition to toast the safe flight upon landing! And he popped open the champagne and glasses were raised in celebration of the great flight! What’s it like after landing? What’s the process of packing the balloon up like? I have to say, I had been to balloon glows and all but really wasn’t sure how they go about packing the balloon. 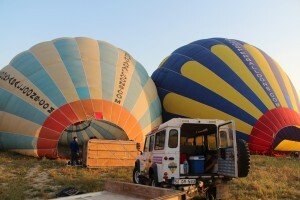 We all were told to stay put while the crew got busy pulling on ropes and trying to get the balloon down on the ground. Here’s a video I shot on my phone while I watched. Thank you for adding this to your blog on balloon ride. All these questions were on my mind and was great to get answers. Looked like an axing adventure. LOL! Love it! Typos happen. Thanks for commenting. Awesomeness Janice!, and brings back some wonderful memories for me. I have a Commercial Hot-Air Balloon License, in a previous life I flew passengers and gave flight instruction. 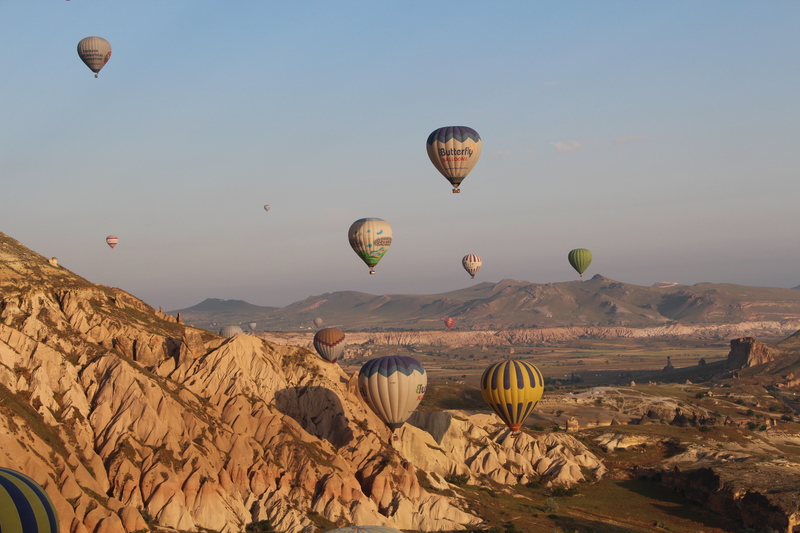 The view in Turkey reminded me of some flights over Camelback mountain in the Phoenix area. Thanks for sharing your adventures! Glad you enjoyed it! I had no idea you had a ballooning license!